In every celebration of the Eucharist, there should be a sufficient number of ministers of Holy Communion so that the Holy Communion may be distributed in a reverent and orderly manner. Bishops, priests and deacons distribute Holy Communion in virtue of their office as ordinary ministers of the Body and Blood of the Lord. When the size of the congregation is massive or goes beyond the capacity of the priest, he may also depute suitable faithful for this single occasion. These faithful are also called Extraordinary Eucharistic ministers of Holy Communion. At St. Mary’s Catholic Church Dubai, we have over 160 Extraordinary Eucharistic Ministers headed by our Parish Priest Reverend Fr. Lennie Connully. Under the guidance of our spiritual director Reverend Fr. Alex Vachaparambil, we have 50 dedicated Extraordinary Ministers of Holy Communion for the Malayalam Community- including both men and women. Extraordinary Ministers of Holy Communion receive sufficient spiritual, theological, and practical preparation for 4-6 sessions to fulfill their role with knowledge and reverence. In all matters they should follow the guidance of H.E Bishop Paul Hinder. They are trained to very high standards and constantly monitored for competence and devotion. There is a coordinator who watches out for any glitches and communicates between the EM’s and the priest. The period of service lasts for 6 years. All Extraordinary Ministers of Holy Communion should show the greatest reverence for the Most Holy Eucharist by their demeanour, attire, and the manner in which they handle the consecrated bread or wine. Women are dressed in white albs whilst men must wear white shirts, black pants and Blue ties. Lapel Pins must be worn by both at times of service. Extraordinary Eucharistic Ministers are a sign of the fact that they are constantly striving to be of greater service to the church and the world; to be an embodiment of the community’s hope for itself. An Extraordinary Eucharistic Minister sets an example as one whose life is governed by the fullness of the Eucharist. Our ministers have offered their time and efforts for the English and Malayalam Masses. 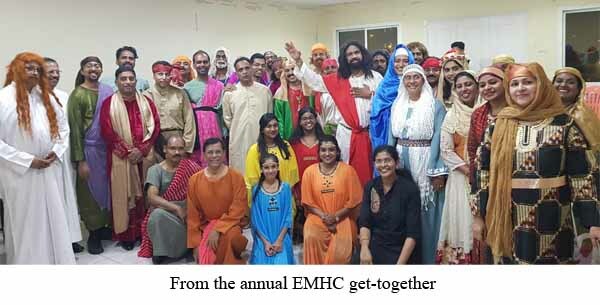 A number of EM’s even take a day off from work to serve masses on weekends and festivals that draw huge crowds. They play a crucial role in the Church and immensely enhance parish ministry. In the absence of lay Eucharistic ministers, priests would be overwhelmed, and parish ministry to the sick and homebound would be drastically curtailed. That would surely be a very serious loss. They set an example as one whose life is governed by the fullness of the Eucharist. They do not stand as perfect examples but as a sign, that our struggle to live the Christian life is not in vain. Hence they are devout, reverent and good models of the Catholic faith. 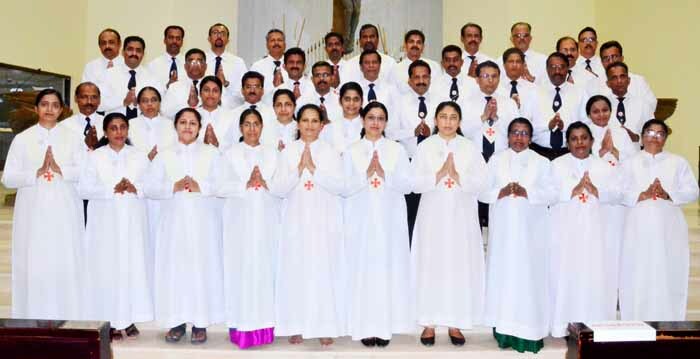 The Extraordinary Ministers of Holy Communion of the Malayalam community are thankful, first and foremost to the Almighty God, and to Fr.Lennie Connully and Fr. Alex Vachaparambil for giving us the opportunity to serve the Lord and our parish.